Every year about this time I get the urge to reset things. Sort of like when the computer wont boot up properly and starts to get glitchy because something didn’t load right – just click Restart and try again. We plan our year on the farm by grabbing a new calendar and hammering down dates. Dates to get the weaner pigs, date to order the new layers, the meat birds, date to process the meat birds, date to slaughter the pigs. There are blocks of time set aside for processing the gardens, canning the salmon, a date when Miss Daisy Duke is likely going to drop her calf. Everything is pre-planned. Twelve weeks from the date of the meat bird arrival, is a date set aside to process the meat birds. A date to process the old layers and put them in canning jars…and so on. For the most part, its a rigid system. One cannot just ‘wing it’ when it comes to livestock, or putting food up for the winter…..well you can I suppose – but then the entire year turns into a gong show. Then there are the long weekends – those ‘dates’ are set aside for projects. This year we will set aside a long weekend to get the new fence around the lagoon strung, a corresponding cross-fence strung, and because horses are horses and the grass is always greener on the other side – we will electrify the top wire. Projects – there are always any number of projects that need to be done on the farm, not necessarily new projects, sometimes dates have to be set aside to fix things that didn’t survive the wear and tear of winter, or the wear and tear of livestock. All of these dates, are also nailed down for budgetary reasons. If we’re going to string the lagoon fence, I need to budget the purchase of more wire and more fencing nails. If we’re going to have neighbour down the road swing by with his handy dandy bobcat with it’s handy dandy auger to churn up some clay so we can plant more fence posts – I need to budget paying the man. This yearly reset has been something we’ve done for years – I’m very much not a fan of surprises, of the unexpected. I’m capable of dealing with an upset to the carefully set out schedule of ‘things that will happen this coming year’, but it’s not something I like to accommodate. That calendar, with it’s blocks of time laid out, with it’s little notes in the margins, is reassuring to me, and it means I’m not going to forget something obvious. This past year for instance – while we were up in the mountains on one of our cut down firewood trips, I happened to notice my cell phone screen flashing (generally there is no cell service up there), picked it up to see a message that our salmon was ready to be picked up. What? Now? Today? In an instant we are double timing the firewood project, racing (but trying not to speed and draw attention to the fact that we are hauling wood that is not cut to the required 24 inches) down the mountain, down the highway, through town and home to drop the trailer and grab the cash to go pick up the fish on the north end of town. As I’m grabbing the cash I see a message flashing on the land line. I stop to listen – neighbour down the road is in the middle of haying and something has run amok with his tractor and can we come take a look at it. What? Now? Today? We race into town, fetch up all the salmon, race home and toss it on ice, race back down the road and see if we can figure out what’s going on with a nearly new tractor that suddenly won’t pick up a round bale. Ultimately, this is how ones carefully laid plans fall apart. We had scheduled zero dates for getting our own firewood, as a result I completely forgot about the salmon – and well I can’t fault the neighbour for a faulty part in his tractor. 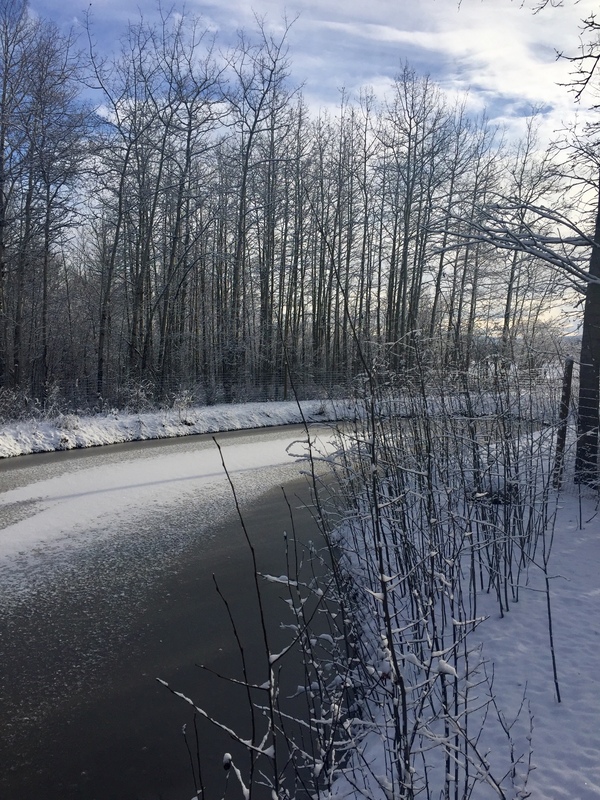 Normally we process the salmon the day we get it….for the first time ever – it sat on ice for two days and Bruce spent his ‘day off’ canning and smoking the salmon. 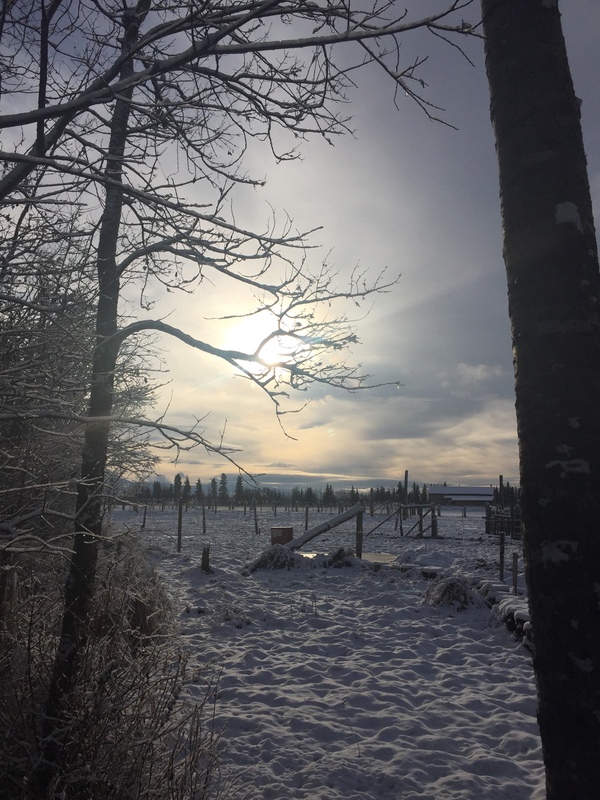 I suppose adaptability is the name of the game when you farm, or homestead….and we’ve certainly learned to be adaptable in our near thirteen years here. This coming year however….I’m not going to hit the ‘restart’ button. I’m flat out going to pound on the ‘control/alt/delete’ keys until the entire past year short circuits into the stratosphere. I want a clean, clean page to start over on – a page with no wrinkles, no doodles, no coffee cup stains. I am going to take the next calendar and block out dates for me. Yes – me. I want a set in stone time to go and visit my mom and my nephew, to spend time wandering downtown Vancouver and pigging out on the best Samosas made fresh in the tiniest space of a store-front, to go to Banyan Books and stock up on odd things. A set in stone time to go and visit my daughter and her family, and maybe get another ride on the street car over the High Level Bridge and spend a day on Whyte Avenue and hit all of the stores, including Spice Island. A set in stone time to catch up with my son wherever he might be hauling this equipment to that place or the forest to the factory – and spend time on a ride along either in my old stomping grounds where I grew up in northern Alberta, or if I’m lucky on one of those awesome mountain ‘goat trails’ with a load of logs – where I can look out the window and know that if the road gives way, we are in for a four thousand foot ride. I have not set foot off of this farm other than to go to work – for over a year. It shows. I have forgotten how to appreciate where I live – at this moment – I barely like the place – let alone appreciate it. I am, at heart, a homebody. Still, there is something to be said for being able to get on the ‘outside’ and look in. Whenever I come back from the lower mainland – I totally appreciate the breathing room, the open skies, the complete lack of population by comparison. When I return from a trip to my daughters I appreciate the peace and quiet of my house – her place is much like grand central – and I love it – but I love my quiet house more. This past year – I made the mistake of not setting aside those ‘dates’ on the calendar. I figured (incorrectly) that I could just ‘pick a time’ and make a run for it. I tried. More than once. Lots of last minute cancellations on my part……there was just no room to accommodate me. This year….I am going to move my job from the top of my priority list, to somewhere else on the list. Of course employment is a priority of sorts – but in this entire past year, I have only managed to take four, count them – four (and not all in a row) extra days off. It’s daft. I have, for several years now, been owed three weeks holidays a year. Hahaha! I have never, not once in eleven years at the same job, managed to squeak more than a single week of time off in the span of the entire year. Because I am the only employee that does the job I do – there is no one to step into my shoes while I am gone. Excepting for the boss, who has no desire to work that hard any more, who is by his own admission ‘out of the loop’ on many of things one need to know to do what I do. In short – I’m weary of feeling like I’m being held hostage to the place. Some of the issue of course, is mine – I don’t like to leave the man hanging, if I’m not there, it creates a lot of stress on the rest of the employees. Still – it occurred to me not so long ago – my loyalty to the place has become a detriment to my sense of well being. I don’t have a horse in that race – therefore I need to back off, understand that the place will still function without me in some fashion should I be ‘away’ for a week. Or maybe two. 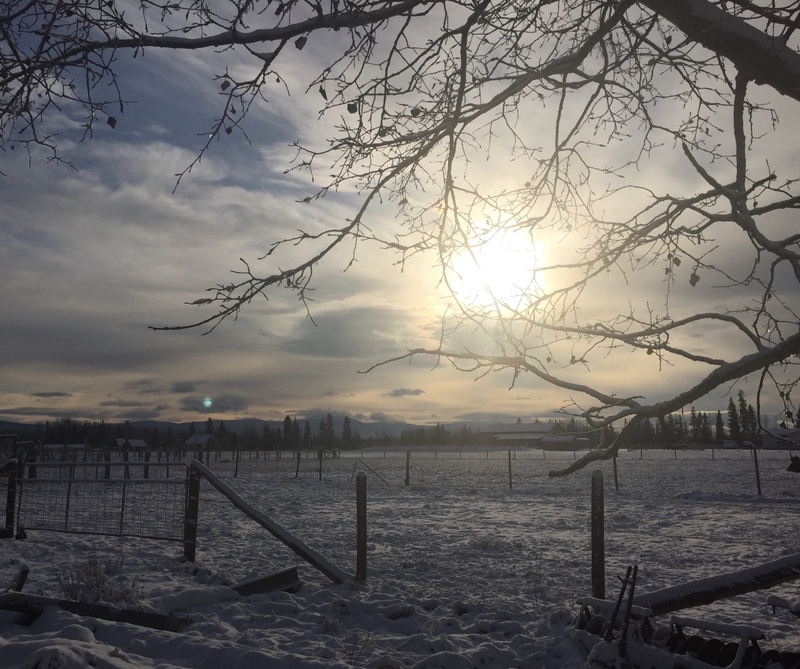 This entry was posted in Uncategorized and tagged farming, homesteading, winter. Bookmark the permalink. Now that sounds like a plan. Book those personal days now, before the world gets them and won’t give them back. Maybe I’ll look at a bit of that myself. For sure 🙂 Where I work – I will need to book those times by the middle of January – or they won’t be available. I know your employment is a tough taskmaster. It’s funny, I’m self-employed, and not much nicer to my one employee when it comes to time. I was thinking earlier this week just how varied each of our lives are here that blog on WordPress…. You were one of the people I was thinking about…living much further north than I, working your tails off as you do… (I’m still subconsciously thinking about those two earlier blog posts you’d written, one mentioning having visitors, and wondering how they would react to what life was like where you live) I grew up on the farm, and my dad still heats with wood…so when you go down the list of annual activities, I can relate to everything in this post except getting the salmon. 🙂 I second your intention to block out more time for you next season…! It is SO important. It’s one of my goals for sure. I often wonder how homesteaders in ‘pioneer’ days, handled the isolation and the lack of time or means to leave the farm. I wonder if they ever wondered what was on the other side of the hill so to speak. I’ve read a few accounts/diaries/ etc. I am intrigued by the same sort of questions. Time spent @ social events (school programs when there were enough settlers to have a country school, were more of a priority.. (I have an account of several settlers in an old book back in the mid 1800’s all heading to the timber to cut wood together..you could hear the jingle jingle jingle of the bells on the horses as they were all traveling in a group….and not sure if it’s true, but I’ve read some of the women had little birds they kept just to have as a companion, so as to not go bonkers..
Another great post. I do wonder if the ‘scheduling time for me’ is also a woman thing? Not saying men don’t want time for themselves, and I presume all homesteaders probably have the same issue. But in ‘city life’, I wonder if women tend to take on or multitask more due to ingrained ‘pressure’ from society which we try, whether consciously or subconsciously to uphold? Regardless (notice I said regardless not irregardless cause I KNOW you HATE that term lol!!) so glad you are planning on doing this. You go girl! You deserve it. Yes another great post to read. Sometimes I realize I can find out what my daughter does or really thinks is through her blog. Like getting to know her a little better. I often brag to friends and or strangers I chat with in moments of pride. She is a great writer and gives great insite of what really being self sufficient is all about. Must take after me hah – I write all the time about events in my life. Its a solid way to ground my self. Analyzing whether something was good or how things can be changed. I can also fit into the category of ‘the scheduling woman”. Its a way of making all ends meet. Not only get up every day and do the 9 to 5er, we fall into the spaces of filling every moment making a good home and that means all the house hold chores doing repairs and maintenance. Finding a moment to take a breath at the beach, keep all the plants (and my garden pots) in the best condition and of course paying all the bills 🙂 I am a list maker and have stuff noted at the top and less important stuff written at the bottom. I miss my family and without the tech mode our lives would be a little empty. Never enough hugs but I still understand that when you raise children and when they leave home to make their own way we know that they may be many miles away but the love and understanding of all the trials and tribulations are forever giving us a feeling that we will never fall short of a fresh day ahead of us and they will always love back unconditionally. To everybody – have an awsome day! Hoping you have the best year ever.